Some advisement or support for an individual seeking employment. I have written many blogs/articles about the idea of adding a “pull approach” to employment seeking – where you “pull” potential employers to your professional website. You can read more about this concept by clicking here (scroll down to see the blogs). I wanted to write a blog about some of the questions I have fielded along with my responses. How does a potential employer find out what type of career I am interested in? There are a few ways to share your career aspirations through your professional website. First, you can write a mission or objective statement – something commonly found at the top of a resume – and make it a focal point on the home page of your professional website. Second, you can take advantage of the skill-based approach and present your skill set – something an employer can use to infer what career opportunities you would be interested in. Third, you can setup a SEO campaign to target career opportunities where you live; it takes time to be properly indexed in a search engine so this is more effective for a long-term employment search (or what we call “casual employment seeking”, i.e. when you are already employed but would be willing to explore other employment opportunities). Fourth, keep up a blog; potential employers can learn more about you on a personal level. I would like to see the concept of a “pull approach” to become more popular, enough so that web service companies develop new technologies to make it more effective. I envision a search mechanism that indexes personal websites, for example. How much should I rely on a “pull approach” to find employment? I would take the same amount of time applying to jobs with the traditional approach (what we call a “push” approach), especially if you are early in your career. You can respond to job listings by sending not only the traditional PDF cover letter and resume, but also an email invitation to visit your professional website ; of course, you would prefer they follow the invitation because of the richer content and communication features of a professional website. LinkedIn and MonsterJobs have effective search mechanisms where employers can find you by searching through a skill set; I recommend linking your profiles to your professional website, so an employer winds up there. Is there a way to tailor my website for a particular employment opportunity? Yes. You can optimize your website by setting up the sections you want to make available, and within the section, turn “on” or “off” line-items. In addition, you can make a targeted cover letter available to a potential employer visiting your website from an email invitation. They follow a link from your invitation, log into your website, and are then taken to a page where the targeted cover letter appears. How do I keep track of potential employers visiting my website? You can incorporate Google Analytics with your professional website. This helps you keep track of how visitors are finding you, what content they are accessing, and how long they are on your website. There is also a feature where a potential employer can leave a message after visiting your website for an employment opportunity; this functions like a guestbook. They can leave a message about the opportunity, how to contact them, and what the next step might be. Is a “pull approach” more effective for certain professions? Is a “pull approach” more effective at certain career stages? I would expect that if you are seeking employment in IT, business, and communications, a “pull approach” might be more effective because of the direct influence of web media and the faster pace of hiring in these areas. I have experienced recruiters trying to fill a web designer job in a matter of hours. Matching job seekers with potential employers is a long standing, well established system. There are certain professions, such as entry-level lawyers and doctors, where there is a courting and internship programs that will ultimately determine whether you get an offer. However, even if you do not effectively pull a potential employer to your website, a professional website is still an excellent way to represent you. A “pull approach” can only be effective if employers actively seek employees, something we have discussed in previous blogs. The best evidence that this is happening is the success of LinkedIn’s flagship product Recruiter, where recruiters pay to access LinkedIn’s network to find potential candidates. The average age of a LinkedIn user is 42, which means they are established professionals. So there is no clear indication how effective a pull approach would be for early career professionals, but some indication it could be effective for mid to late career professionals. Let’s make this an open forum so we can develop this “pull approach” concept; please leave your questions as a comment. TheProfessionalWebsite provides you with a your own professional website – the ideal platform to pull potential employers to. In previous blogs, I defined what a pull approach is in employment seeking and provided evidence that it could be effective (Pull Approach, Employment Seeking, Evidence A Pull Approach Is Effective). I would like to discuss how you actually implement a pull approach, what do you need to do to get potential employers to visit your professional website. Many of the tactics mirror what businesses do to increase traffic to their websites, though there are some subtle differences; these tactics include: SEO (search engine optimization), social media and job board landing page, participation in blogs related to your field of interest, and presentation of a skill set. It is also worth mentioning that the idea of a pull approach is evolving, so there may become new tactics as web service companies develop technologies to work with a pull approach. A professional website is built with strong SEO fundamentals, including: the use of meta tags, content rendered as HTML text, and the structure and naming of pages. Meta tags can be used to lure potential employers when they search on keywords in a search engine; you can create meta tags that describe your field of interest, past employment or education, where you live, core-competencies, something you worked on, and any other keywords a potential employer might search on. You can and should use Google Analytics to monitor traffic to your professional website; keep an eye on how many hits you are getting, where the hits are coming from, and what search keywords are driving the traffic. Understand that it may take a few weeks before your website gets fully indexed by the major search engines. In a previous blog, I introduced a “pull approach” to employment seeking – where you “pull” potential employers to your professional website to find employment (Pull Approach, Employment Seeking). The effectiveness of this approach hinges on whether potential employers seek employees. For many reasons, I think this is where the landscape of finding employment is going and there is evidence that it has already gained traction. One of the biggest reasons why employers are increasingly seeking employees is because the current approach – where employees seek employers – is so inefficient. Potential employers are required to post employment opportunities in many places, such as job boards, newspapers, on their corporate website, etc. This is expensive because of overhead, time, and the use of other resources. However, the biggest problem is that strong candidates who did not find the job posting will not be considered for the opportunity. Evidence that the current approach – where employees seek employers – is on a serious decline can seen by the precipitous loss of market value of the major players offering related services, for example, MonsterJobs has lost a staggering 81% of its value over the last 5 years (according to a Forbes article in the July 12th issue). There is a faster pace in finding talent for immediate needs. Much of this comes from the velocity of information technology development in the service industry. The current process can take months to hire the right candidate; a posting is added, candidates submit their resume, resumes are evaluated, and interviews are setup and conducted. With a “pull approach”, the first three of these steps go away. Theoretically a potential employer can be at an interviewing stage within a few hours. Viewing a professional website is much faster and easier than a standard resume for evaluating a potential employee. A professional website is essentially a multi-dimensional resume with rich content (and multimedia), communication features, and an internal searching mechanism. Moreover, it is easier to evaluate among a team – simply share a professional website URL among colleagues. With an effective search mechanism in place, a potential employer can quickly get a finely-tuned search result (or list) of talented professionals in a manner of minutes. A professional website, built on a skills-based foundation, has the necessary structure and keywords to be searched through. The evidence that potential employers are seeking employees can be found in the success of LinkedIn and their flagship product Recruiter. It is one of their biggest revenue generating services and can cost as much as $8,000 per user (according to the same Forbes article mentioned above). Clearly, companies are purchasing this service and using it to find employees. There are some issues in relying on a LinkedIn profile to represent you. First, you do not own all the content with your free profile, and LinkedIn can use the content to generate revenue with third party marketers. Second, it does not necessarily represent everything about you. Third, it currently does not support all multimedia content such as video, audio, etc.. Fourth, it does not have the stylistic appeal of a website. In summary, it is not necessarily setup as a way for you to project yourself in the best possible way. There is a place in your LinkedIn profile where you can share a link to a website – I suggest using it to share your professional website. Finally, there is one subtle difference with the LinkedIn approach. The idea of a “pull approach” is to give you all of the functionality you need to best market yourself and effectively lure potential employers to your professional website. You are always in control. It does not mean just having your profile getting found in a search by an employer. 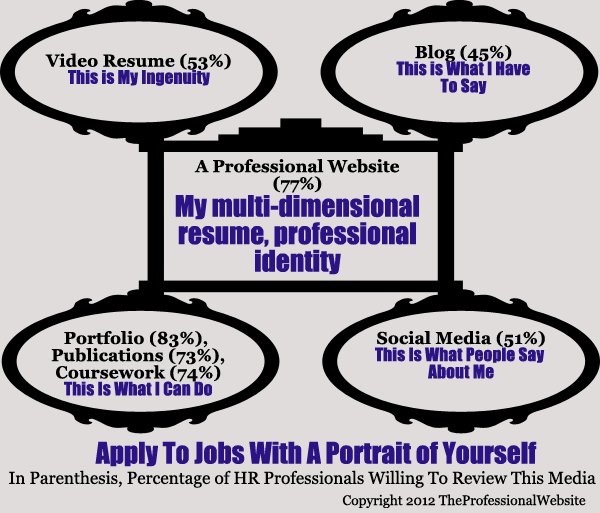 TheProfessionalWebsite provides a professional website, which is the ideal platform to “pull” potential employers to. Read more from the July 2012 Forbes article referenced above: How LinkedIn Has Turned Your Resume Into A Cash Machine. The traditional approach for seeking employment is to find a job listing and apply to it by email or filling out an online form. We call this a “push approach”, where you “push” a resume to a potential employer. Within this approach, there are two different strategies: applying to a few positions with unique resumes and cover letters or applying to many positions with a generic resume and cover letter. For example, someone applying for a judge clerkship would take the first strategy and someone applying for a database administrator would take the latter strategy. A professional website has functionality for a “push approach” with both of these strategies. Most of the content collected for a professional website can be used to generate a standard resume. You can also include sections not commonly shown on a resume – such as a portfolio. You have complete control over which sections appear on your resume and, within the section, what content appears (each line-item has “on” and “off” switches). A professional website also has functionality to build a list of contacts who you are sending your employment applications to. Also, you can track applications you sent and update their statuses. Companies are increasingly using web services to find talent for employment opportunities; for example, drawing from my own personal experience, I have recently been contacted by hiring personnel from three companies based on my LinkedIn profile. Having potential employers find you can take some of the onus off of you to search (and apply) through the many job listing directories and perhaps avoid missing out an opportunity just because you did not find the listing. I call this a “pull approach” to employment seeking, where you “pull” potential employers to your professional website – an ideal landing platform. With a professional website, there are many advantages in having a “pull approach” . “Pulling” a potential employer can be accomplished by using SEO (“search engine optimization”) or getting found in search engines, setting up your professional website to be a landing page in social media, and sending invitations to hiring professionals. Learn more about how to implement a “pull approach” by reading my blog entry How To Implement a Pull Approach. Professionals often have to verify their proficiency in a technology, language, or skill; we will refer to the presentation and validation of this proficiency as a “badge”. Visually speaking, a badge could be a background image with overlaying content about the proficiency and perhaps a link to a third-party verification. A professional website currently promotes the presentation functionality of “badges”. The use of skills is already tightly woven into the framework of a professional website, along with particular IT skills, languages, and certifications – much of the content and linkages related to a “badge” are already in place. However, the validation integration has not been developed yet.